“No way.” He’s been asking me to make him something with pigs for years, as the pig is his favourite animal but this is Israel, after all. Can you imagine a nice orthodox man with a big kippah and tzitzis and beard walking around the Western Wall wearing a pig sweater? If he were over 6′ tall and a body-builder, I might have relented but he’s only 5’4″. Baruch is a microbiologist in the pharmaceutical industry. I thought about it and studied his sketches. The angles of the lines and the hexagons looked like a charter’s nightmare and I decided, in the end, that I wouldn’t be able to translate them into knitting, not in the immediate future. I pondered for 2 minutes, then said, “That’s do-able.” He photocopied the periodic table from his highschool chemistry textbook and I charted the actinides and lanthanides. Halfway through the lanthanides, I realised that I didn’t need a chart after all and just knitted it directly from the photocopy. Any mistakes were corrected later with duplicate stitch. The sleeves have fungi on one sleeve and bacteria on the other. His sweater was a hit at work and he was invited to give special showings in the chemistry labs. The sweater was knitted in the round. I machine-stitched and cut steeks for the armholes. A chemist neighbour borrowed the sweater for his mother-in-law to copy. When I realised that we wouldn’t have the sweater back by winter, I offered to provide charts. Important note: This chart is out of date. If you want a current chart with the most recent elements, you’re on your own! Front and back charts are 109 stitches x 112 rows. I cut the charts in half so that they could be printed easily. When my son was young, I briefly considered making a sweater for him of the square for gold (AU), with all the atomic number, atomic mass, etc., worked in intarsia. 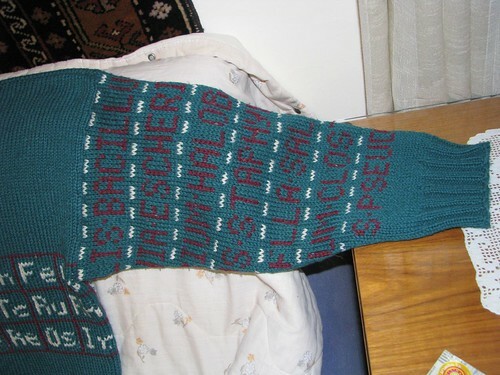 This entry was posted on August 5, 2009 at 6:55 am	and is filed under knitting, needlework. Tagged: chemistry, knitting, Periodic Table, sweater. You can follow any responses to this entry through the RSS 2.0 feed. You can leave a response, or trackback from your own site. 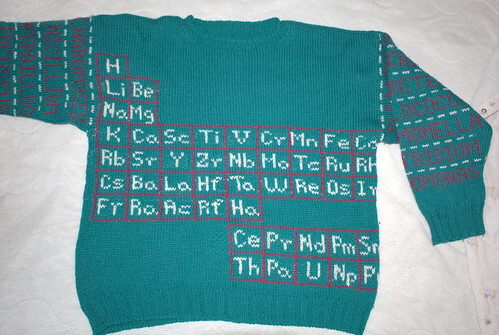 I love the periodic table sweater and I love hearing the story about its genesis! I had not realized that there was Bacteria AND fungi. It just makes me smile! Wow! That is a thing of beauty. The bacteria and fungi are fabulous bonus details. I would pay so very, very much money for such a sweater as this. Truly I would! So awesome. Now I want one. I am on Ravelry but I’ve only gone there once. Is there a place to post a link? Or do I start a thread on a forum? You could post pictures/description of the sweater in your own Projects, and then share it with groups — there are several scientist groups on Ravelry, all of whom would be highly entertained by both the sweater and the story behind it I’m sure. I knew you were cool Avital, but this is truly another level of cool. I’m just being picky, but the Fluorine F seems to have turned into an extra Phosphorus P at the top of the halogens column. You’re right! I guess no one noticed before because it’s on the back of the sweater. Maybe I still have some of the yarn around and can repair it. Thanks! 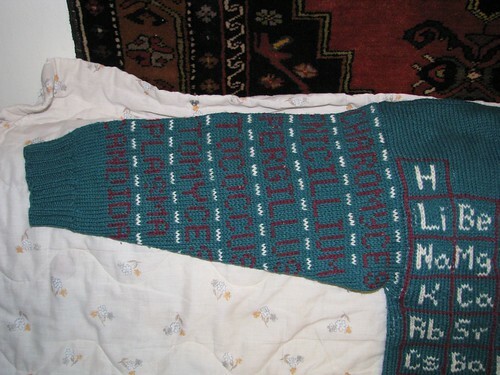 Stumbled upon this from boing-boing.net.. Really geeky cool sweater! I love this!! Can I use a couple of your pics to post about this over on my blog? You’re more than welcome to use the photos! I’d appreciate it if you include a link to my original blog posting. Thanks! I would like see you get this machine made and make a million from chemists and their students . Good perhaps for CHEM WEEK 2010. Too bad any more sweaters can’t be done by Oct. The theme for National Chemistry Week 2009 (NCW; Oct. 18-24) is “It’s elemental” and is centered on the Periodic Table. I would be happy for you to use the pictures from my blog, if that’s easiest. Please link back to my blog. Thank-you! He would have to be very flexible to see all the elements on the back of the sweater! It is actually amazing! What I would give to have this little number in my life! Wow! The Periodic Table pattern is very interesting! I found it is something my grandson has to have! I have the appropriate yarns (almost the same three colors) already; I’m going to start it tonight !!! Avital, I love this sweater…..I left you a comment after your comment on your blog just to say that I met my husband in freshman chem. We were lab partners! He was a physics major and I was a bio major, minored in chem. The rest was history…very geeky history. Thanks for sharing your sweater!!!! that is the most awesome sweater EVER! 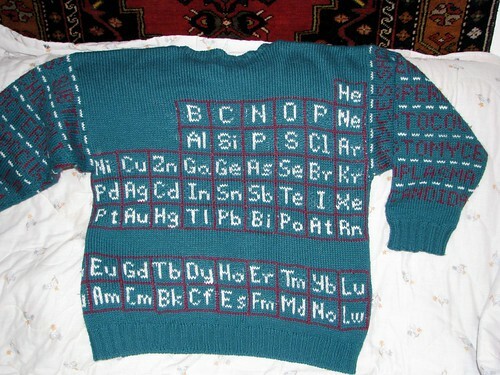 My daughter is taking chemistry in her junior year of high school and I WISH I could knit this for her! She is a beautiful geek, wears a tshirt that says “captain nerdy” proudly. cracks me up! anyway, great idea and great work! Maybe she could knit it! The chart isn’t all that difficult to follow if she has a basic sweater pattern. You are my hero! This is awesome! Great work and congrats from Phoenix, USA. I can see why this sweater was such an enormous hit… absolutely incredible!